This demo video demonstrates the capabilities of the PTZ-HD-10 1080P PTZ IR security camera. This is a demo of a high definition PTZ security camera controlled by an iDVR-PRO surveillance DVR. Camera 3 on this screen is the HD PTZ. To control the camera, I activate the pan tilt zoom screen by clicking on this icon. I already have a number of preset locations setup. Adding a presets is simple. Users select the preset number they want to configure using this drop down, then create a name using the virtual keyboard. I am doing all of this using the USB mouse attached to the DVR. Then, I navigate to the location that I want to save using the PTZ controls. Last, I lock in the location by clicking on this set button. The new preset will appear in this menu. Users can navigate to any preset location by clicking on these arrow buttons. Users can directly control the pan tilt zoom of the camera using these controls. This dumpster is located a little more than 100 feet away from where the camera is mounted. I zoom in all the way so that you can see how clear the 10 times zoom is from this distance. Although there are focus and iris controls, they are rarely used because the camera adjusts its focus and iris levels automatically. The iDVR-PRO DVR supports scan and tour functions for PTZ cameras. Scan navigates between two preset locations and pauses for a set number of seconds at each location. Tour can be programmed to navigate automatically to 16 preset locations and pause for a set number of seconds at each location. I am going to activate the scan by clicking this on button. I can then exit the PTZ screen so that we can view the camera full screen in 1080p resolution. You can see that the scan simply moves the camera back and further between two points, pausing at each location. I am going to go back into the PTZ screen to demonstrate a tour next. First, I turn off the scan. Then select tour, and turn it on. Again, I will exist the PTZ screen so that we can see the camera’s 1080p resolution full screen. The camera will move to each location on the tour and pause before moving to the next location. I switch back to the 4 camera view. You can see that the tour continues regardless of the screen view. The other security cameras in this view are also 1080p HD resolution, but they are fixed lens cameras, not PTZ. The PTZ-HD-10 that was used in this video supports up the coax for PTZ commands. This means that installers do not need to run a separate pair of cable for the PTZ communication. Both the video and PTZ commands are communicated to the DVR over RG59 coax cable. When used with an iDVR-PRO and also connected to network router, the PTZ camera can be controlled with iPhone and Android mobile apps. Windows and Mac desktop software is also included. The PTZ-HD-10 is a 4-in-1 camera that supports the following video standards: AHD, HD-TVI, HDCVI, and analog CCTV. 1080p resolution is supported for AHD, HD-TVI, and HDCVI modes. 960H resolution is supported for analog CCTV mode. 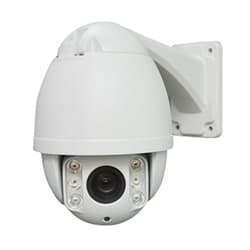 Although not demonstrated in this video, this camera has high powered infrared LEDs built-in which support IR video in zero light up to 150 feet. This camera is enclosed in a IP66 weatherproof housing for outdoor installation. A wall mount bracket is included. Ceiling and corner mounts are available. For more information, please visit www.cctvcamerapros.com/HD10. Thank you for watching. Click here to learn more about the PTZ-HD-10 1080P PTZ IR Security Camera used in this video.